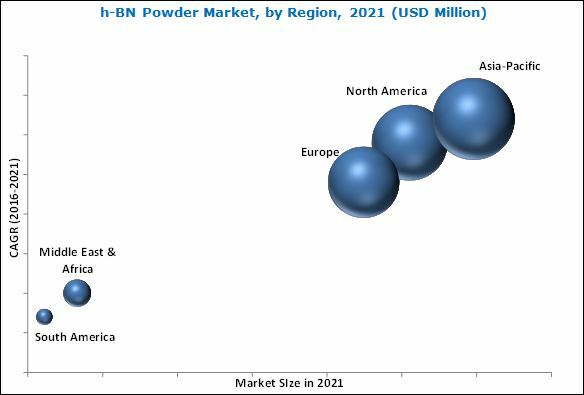 [152 Pages Report] The global hexagonal-Boron Nitride (h-BN) powder market was USD 611.5 Million in 2015, and is estimated to reach USD 821.0 Million by 2021, at a CAGR of 5.1% from 2016 to 2021. 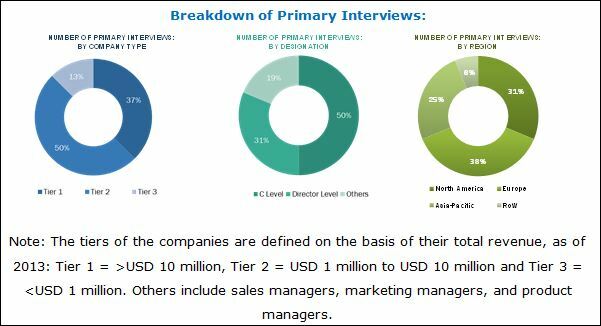 Both, top-down and bottom-up approaches have been used to estimate and validate the size of the global h-BN powder market and to estimate the sizes of various other dependent submarkets in the overall h-BN powder market. The research study involved the extensive use of secondary sources, directories, and databases such as Hoovers, Bloomberg, Chemical Weekly, Factiva, and other government and private websites to identify and collect information useful for the technical, market-oriented, and commercial study of the global h-BN powder market. The value chain of the h-BN powder market starts with the sourcing of basic raw materials, manufacturing and supplying to intermediate product manufacturers, and ends with use in the various end-use applications. The raw materials for these products are boric acid, borax, calcium borate, melamine, ammonia, urea, nitrogen gas and other boron and nitrogen containing compounds. Suppliers of these raw materials include U.S. Borax, Inc. (the U.S.), Searles Valley Minerals (the U.S), Yara International (Norway), CF Industries Holdings, Inc. (the U.S.), Ab Etiproducts Oy (Finland), Russian Bor (Russia), Dalian Jinma Boron Technology Group., Inc. (China), and Dashiqiao Huaxin Chemical Co., Ltd. (China). The major manufacturers of h-BN powder include Saint-Gobain S.A. (France), 3M (U.S.), Denka Company ltd. (Japan), Showa Denko K.K. (Japan), Kennametal Inc. (U.S.), Momentive Performance Materials Inc. (U.S.), HC Starck GmbH (Germany), Mizushima Ferroalloy Co., Ltd. (Japan), ZYP Coatings, Inc. (U.S.), and Henze Boron Nitride Products AG (Germany). This research report categorizes the global h-BN powder market on the basis of application, and region. The global hexagonal-boron nitride (h-BN) powder market is estimated to reach USD 821.0 Million by 2021, at a CAGR of 5.1% from 2016 to 2021. H-BN powder has high thermal stability and excellent electrical insulation properties, and H-BN powder products offer high performance and durability. These factors drive the market for the h-BN powder globally. H-BN powder products find usage in applications such as, coatings & mold release, electrical insulation, lubrication-industrial, composites, personal care, paints, lubricants-food, thermal spray, others (dental cements, pencil lead and synthesizing of h-BN). The coatings & mold release application accounted for the largest share of the overall h-BN powder market and is expected to continue to do so throughout the forecast period. The H-BN powder is used for coatings, die-casting and mold release as it exhibits excellent thermal stability which enables efficient operations at high temperatures. Companies are carrying out intense research & development activities to innovate and develop new products which can open new avenues of applications. Saint-Gobain has introduced its CarboTherm h-BN products to enhance thermal conductivity and provide electrical insulation to thermoplastic compounds. The performance chemicals division of EMD chemicals has announced the launch of RonaFlair Boroneige, the functional filler line, specifically used for applications in the cosmetics industry. Growth in the coatings & mold release and electrical insulation applications has increased the demand for h-BN powder. The Asia-Pacific region accounts for the largest share of the global h-BN powder market and is also the fastest-growing market. China is expected to account for the largest share in the Asia-Pacific region till 2021 with India registering the fastest growth rate for the forecast period. Japan has prominent h-BN powder companies such as Denka Company ltd., Showa Denko K.K., and Mizushima Ferroalloy Co. Ltd. The U.S. is the largest market for the h-BN powder in North America. The price of h-BN powder is high as compared to the available alternative substitutes. This is a major restraint in the global h-BN powder market. However, the h-BN powder is preferred over the others due to its superior performance at high temperatures. Companies have adopted the new product development, expansions, partnerships, agreements, and collaborations strategies, to expand their market share and distribution network in the global h-BN powder market for the forecast period, 2016 to 2021. 11.1 Momentive Performance Materials Inc.
11.8 Mizushima Ferroalloy Co., Ltd.